Whether you wrote an article that was posted online, or you were featured in an online article, it is a special occasion. 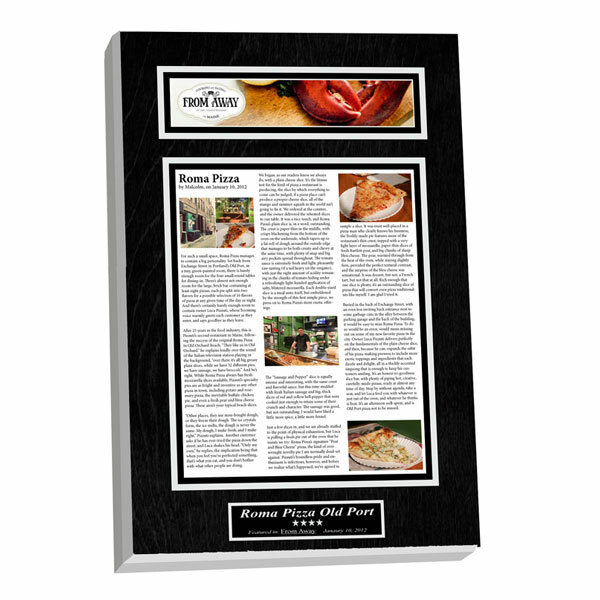 Online articles can last forever in the digital world, and now it is time to bring that article out of the computer and onto your wall with our beautiful hand-made plaques. Our plaques can last for generations and are a great addition to any home or office. But how do you go about making a plaque? How is the preservation done? When you write an article, it is your baby. Maybe it is your first online article, or maybe it is your masterpiece, but whether it is the first or last article you write, you wrote it, which makes it worth remembering. If you or your company are featured in an article, that can only mean good things for you and your business. Whether it is a Top Ten List or your first mention in the news, your online article has recognized you and your business, and that is worth remembering. If you are the author of a recognized article, then your readership can grow and expand. The same goes for your company. If your company was featured, then your business can grow and reach out to more people. We can turn anything into a plaque. An online article, a list, a magazine or newspaper feature, and even photographs. We can even turn an entire blog into a single decorative plaque. Photographs are not out of our limit as well: anniversaries, births and birthdays, weddings, and any other special memory can be preserved with our plaques. If you are in need of more than one plaque, we can also make a custom wall display with your personalization. Custom wall displays are great for those multiple newspaper articles, especially when coupled with preserved photos for optimum memorability. A custom wall display can be themed; you would be in charge of the design. All of our plaques are made with your personalization in mind, so you can have your plaque or custom wall display exactly how you want it. You decide every detail, from the base, to the trim, even exactly what it says on the engraving. The possibilities are, with us, endless. Our plaques are made with you in mind. Your personalized details are what makes the plaque unique. Our plaques are made with a wooden base of mahogany, walnut, whitewash, or natural. The trim around the base is available in black, gold, silver, red, orange, yellow, green, blue, or purple. Our stylish layouts are designed for maximum readability. You choose the information that gets placed on the engraving, such as the title of the online article, who wrote it, when it was published, your name or the name of your company, or anything else you want to include. We can preserve photographs, magazine articles, newspaper articles, blogs and blog posts, and anything you can think of, for any occasion. Each of our layouts are as unique as the achievement they are made for, with categories ranging from awards to the medical field. Plaques can hang anywhere, but whether they hang on the walls of your home, business, or anywhere else, your accomplishments are yours, and they are memorable no matter where they hang. They are a beautiful piece that in the home can be a wonderful reminder of what you have achieved, and in the workplace they can be a professional addition to you or your company’s accomplishments. For any and all questions and information regarding plaques, online articles, and how you can preserve the accomplishments you achieve, contact us today.